The Second Episode of Sri Ramanin Padhaiyil was question and answer section between two personalities namely Swamy Velukkudi Krishnan and Mr. Cho Ramaswamy in which all the questions related to Sri Ramanin Padhaiyil Yatra were asked by Mr. Cho Ramaswamy on our behalf and the same was answered by Velukkudi Sri U. Ve. Krishnan Swami. This section was helpful to all viewers in understanding the purpose of this yatra and the challenges faced in this yatra. Now lets enjoy this conversation. Why was this Yatra initiated? We human beings, all are Jivatma's (Self). We all are born to be happy and we are here to be happy. We all do many activities in search of happiness and pleasure. Whatever pleasure (Sukha) we get through the means of our body (Sharira) is not permanent, it is only for that moment we enjoy. But the pleasure which we get through the means of our Aathma (Soul) is permanent, which you can feel and enjoy whenever you think of it. For Example: If you are seated in an AC (Air Conditioning) Room in a very sunny day, you will enjoy it because AC keeps your body comfortable. Suppose, on some other sunny day, if you are walking in a street you will sure feel uncomfortable moreover sad because you will be missing the AC. You cannot imagine in such a way that AC is with you and you are not feeling the heat of Sun. Hence Sharira Sukha is momentary happiness. If you have visited any temple like Tirumala and had a wonderful darshan of Lord Balaji. Even after returning to your home you can recollect the memories of having Lord Balaji's darshan, which will make you happy. Hence Aathma Sukha will give you the pleasure for longer durations/time and it has more value than Sharira Sukha. 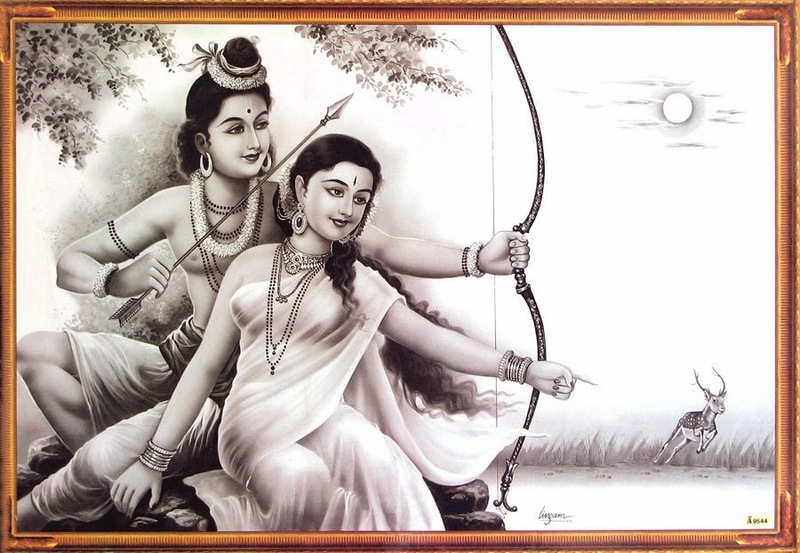 In Bhagavat Gita, Kannan says that do anything which gives happiness to Aathma and not just for Sharira. In Gita's last adhyayam, Sanjaya tells Dhritarashtra that "I am not sure whether i will remember the meaning of 18 adhyayams said by Kannan but for sure i will remember the Vishwaroopam form of Shri Krishna and with that memory i will spend my rest of the days". Hence this Yatra was organised so that we can recollect the divine experiences we had during the yatra even after many years, which gives us immense pleasure. How did you select the places related to Ramayana? First we started with taking down all the details related to places and its directions, mentioned in the stanzas of epic Valmiki Ramayana. We had more than 500 sargams/stanzas, which took us close to one year to collect all the directions of places. We even took Kamba Ramayanam and Tulsidas's Ramcharitmanas for references. Though these three Ramayanams are different in the narration of few incidents occurred but they did not differ in places. The main aim of this yatra was visiting the places related to footsteps of Lord Rama and perform parayanam there, hence we took all details related to it and other differences were not given much importance. After studying all these three books completely, we took Geography maps of Ancient India, Medieval India and Contemporary India to have a check on directions of flow of various rivers and how its course (navigation) have changed over a period of time. Wherever we found the mismatch in all these maps of India, to get the clarification on it we took help of research publications i.e. we referred books like Cunningham's Ancient Geography of India. Cunningham, Alexander edited by Surendranath Majumdar Sastri and Sri Rama Pada Yatra by VD Ramaswami. Prof. Daniel Smith, residing in America had come to India before 20 years from the day of this Yatra and stayed here for period 2-3 years and carried out an research in various places related to Ramayana and had written the travel notes/tips. These notes were sent through Email from America, from which lot of information's were gathered. After gathering all the information, we had few loose ends. An Indian youth from Chennai studying law in London helped us in completing these loose ends by providing the photo copy of the manuscript written by F.E Fergitter from London library. All the information's were gathered through various books written in English & Tamil and published through various publications and authors. All these details and information were confirmed theoretically. Now the challenge is, we have to check whether these places are available in reality also. Hence a pilot team was arranged with few members and were trained with all the information gathered. This team was sent to all the places to verify the same with the information from local people, temple priests etc..
After all these various activities, a fine tuning was done. Which gave us this wonderful divine Yatra in the footsteps of Lord Shri Rama. Can we reach all these places by the means of Bus? We have traveled by Bus, Train, Tractors, Boat and by walk. We have to take all these mode of transport to reach the places. We had even built temporary bridge with the help of local people in a particular place. We need to board six different trains and need to arrange 14 buses at different places. Though the travel is tedious, the divine experience out of it is highly memorable. Is these places are in same condition even today? Most of the places are in same condition itself. What we can say here is, Lord Rama himself is taking care of his places. Hence these places are filled with divinity, sanctity and purity even today. We cannot tell all these places are in exact fashion as it was earlier, we can see lot of development in these place. Anyway we have not lost the sanctity of these places even today. Development is very important for mankind so we cannot avoid it, but we should see to that historic and ancient monuments are maintained well. In what order did you travel? We traveled in the same order as Lord Shri Rama had traveled earlier. There was no deviation in the order. We didn't go to Sri Lanka due to issues in requirement of passport for the journey, but we went till Rameshwaram Thirupullani and then came back to Srirangam and ended with Pattabhishekam Sargam. Does all the places have the same old names? The Old Names as per the scripts are very well known to everybody there but along with it the new names are also come to existence. Is Epic Ramayana a real story? Since, it is said as Ramayana Katha (story) it does not mean it is full of imagination only. When it comes to story, we have true stories as well as imaginary stories. Traditionally the epic belongs to the Treta Yuga which dates back to 880,000 years in the past. Since we have not seen it, we cannot flatly reject it. We have many organisms around us which are too small to be seen clearly with our naked eye but these are visible through the eyes of Microscope. In the similar fashion, we cannot just tell that Ramayana is full of lies and is untrue because we have not seen it. We have to accept it because our ancestors and their ancestors have seen these places and have told us in the form of an story for these many years. We should all be proud of it, since it is traveled from the period of Treta Yuga to the present day and will sure continue from us. Great Scholars like Shankaracharya, Veda Vyasa, Ramanujar, Madhvacharya all have told the same story with seven kandas and 24,000 verses. In between, no one has claimed that Ramayana has changed. It is same from the day one. Shankaracharya has been to Chitrakoot and Badrika Ashram. Ramanujar has been to Chitrakoot and Ayodhya. Even today we can see these places through our own eyes.